Everyone is invited to a service of reflection and tranquillity at All Saints’ Church in Marlow on Sunday 4 November at 5.30pm to remember with thanksgiving those who have died and whom you hold in your heart with love. If you would like some quiet reflection, or to light a candle in memory of a loved one, the church will be open from 5pm until 7pm. 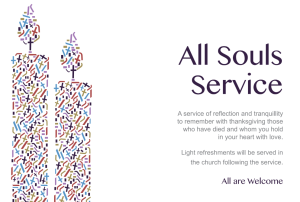 Light refreshments will be served in the Church Hall following the All Souls Service.